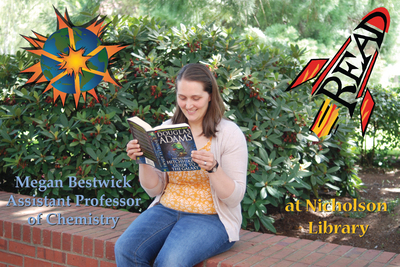 Megan Bestwick, Assistant Professor of Chemistry, reading The Ultimate Hitchhiker's Guide to the Galaxy, by Douglas Adams. Armstrong, Lige and Nicholson Library Staff, "Megan Bestwick READ Poster" (2015). READ Poster Gallery. Image. Submission 144.